SD, a 40-year-old African-American female, presented with a palpable mass in the left breast. Her work-up led to the diagnosis of an infiltrating ductal carcinoma. The patient underwent a partial mastectomy and sentinel lymph node biopsy, with pathology demonstrating a 2.8 cm high-grade carcinoma that was ER(-), PR(-), HER2(-); 1 of the 2 sampled sentinel lymph nodes demonstrated metastatic disease. Thereafter, she received 4 cycles of dose-dense Adriamycin and Cytoxan, followed by weekly paclitaxel. Following chemotherapy, she received radiotherapy at an outside institution to the intact breast to a total dose of 5040 cGy, followed by a boost of 1400 cGy to the tumor bed for a total dose of 6440 cGy. Unfortunately, she palpated a mass below her clavicle, which was biopsied and confirmed recurrent disease 3 years following therapy completion. She was treated with induction chemotherapy and had a good response. She then presented to our cancer center for consideration for further local therapy. The patient underwent a completion axillary lymph node dissection, which demonstrated multiple residual lymph nodes involved with cancer. She was subsequently offered radiation therapy to the axilla and supraclavicular fossa, which included an area of overlap from her prior radiation fields. To minimize risk of late effects from radiation, a hyperfractionated schedule was employed (1 Gy BID to 50 Gy with 6 hours between treatments). The patient is currently free of disease one year following radiation treatment. This case illustrates an important point regarding the adoption of the results of the American College of Surgeons Oncology Group (ACOSOG) Z0011 trial in all patients with involved sentinel lymph nodes. 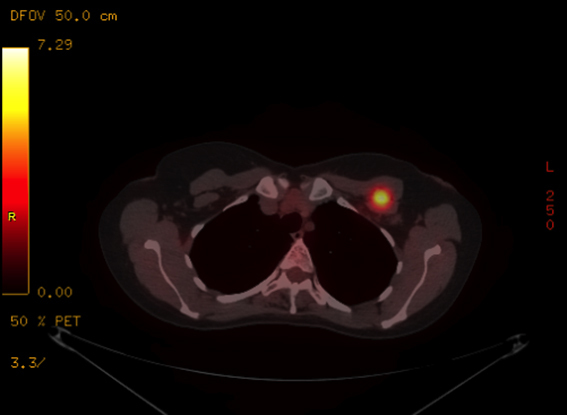 A PET/CT scan performed at the site of recurrence demonstrated a large palpable high axillary lymph node with a maximum standardized uptake value (SUV) of 8.9 (Figure 1). In the post-mastectomy setting, the benefit of treating regional nodes is unequivocal. The British Columbia and Danish trials demonstrated that a 75% reduction in local regional recurrences translated into a survival advantage when the first generation of modern chemotherapy was used.11-13 It must be emphasized that these trials entailed irradiation of the chest wall, entire axilla, supraclavicular fossa, and the internal mammary lymph node chain. These studies support the benefit of adding radiation therapy in post-mastectomy patients with any positive lymph nodes. Nevertheless, many clinicians believe that 1) radiotherapy for patients with 1 to 3 positive lymph nodes is not necessary and, 2) the target need not include the axilla or internal mammary lymph nodes.14 Why does this controversy persist? To derive a benefit from radiotherapy, the risk of recurrence must be > 15%. The largest experience in the U.S. literature reported the results from 4 prospective trials that omitted radiotherapy, in which the loco-regional recurrence rate was 12.9% at 10 years.15 In contention with this data, the re-analysis of the British Columbia and Danish trials demonstrated a similar absolute survival benefit (9%) of regional nodal irradiation in both patients who have 1 to 3 positive nodes, and those with 4 or more positive nodes.16 This latter data is supported by the recent Early Breast Cancer Trialists’ Collaborative Group meta-analysis, which demonstrates a significant reduction in breast cancer mortality at 20 years (p = 0.01).17 Of note, the majority of data includes patients who had irradiation of the axilla or internal mammary lymph nodes. These trials are certainly based on older data, and patient populations with potentially more advanced disease when compared to Z0011, but there are logical reasons to believe they offer meaningful information for treating today’s breast cancer patient. Fundamentally, the Z0011 study asked a question pertaining to the extent of surgery; it did not directly address the role of radiation therapy. Let’s shift our attention to the 2 large cooperative group studies that have recently demonstrated similar paradigm-shifting results, specifically for radiation therapy field design for a similar patient population. The first study is the NCIC Clinical Trials Group MA.20, which was initiated to test the benefit of the addition of irradiation to the axilla, supraclavicular fossa, and the internal mammary lymph nodes, to breast-conserving surgery and axillary dissection followed by standard whole-breast radiotherapy.10 This trial included more than twice as many patients as Z0011, and a very similar patient population with regard to nodal involvement (see Table 1). What is different is that the MA.20 study included slightly more patients with poor prognostic features, such as: high-grade histology (42% vs. 28%), ER- (25.5% vs. 17.3%), and tumors > 2 cm (47.5% vs. 30.7%). As a result, more of the MA.20 patients received chemotherapy (91% vs. 69.4%). The results of this trial demonstrated a marginal improvement in locoregional control as a result of the addition of comprehensive nodal irradiation (94.8% vs. 96.8%). More importantly, there was a substantial improvement in disease-free survival (87% vs. 92.4%), which translated to a 2% increase in overall survival. There was an increase in morbidity related to the larger radiation volumes: Grade 2 and higher pneumonitis increased from 0.2% to 1.3% (p = 0.01), and lymphedema increased from 4.1% to 7.3% (p = 0.004). The discrepancy between locoregional control and disease-free survival may be attributed to the inability to detect a nodal recurrence by physical exam, especially in the dissected axilla and internal mammary chain. The case presented illustrates this point, since this large lymph node was missed on clinical exam. A second explanation for the lack of an overwhelming benefit in locoregional control may be due to the way in which patients were categorized. Overall, this disease appears to be a harbinger of distant metastases, and by the time a regional recurrence is noted, distant disease may already be present. Such patients may not have been designated as having a locoregional recurrence, as it is common practice in many trials to record only the first site of recurrence, thereby categorizing such patients in the distant failure group. The second study examining the role of comprehensive nodal irradiation is the EORTC 22922/10925 trial. This study was designed to determine whether there is an overall survival benefit of adding radiation therapy to the internal mammary and medial supraclavicular lymph nodes to standard chest wall or whole-breast irradiation. Patients eligible for the trial were required to have one of the following adverse prognostic factors: positive axillary lymph nodes or central/medial tumor location in the absence of axillary lymph node involvement. In contrast to Z0011, this trial incorporated patients who underwent a mastectomy as well as a large cohort of patients who were lower risk, including 44% of patients who were node negative (see Table 1). This study accrued 4004 patients from 1996 to 2004. With a median follow-up of 10.9 years, the addition of nodal irradiation was found to reduce the regional recurrence rate from 4.2% to 2.7%. Similar to the MA.20 study, there was a more impressive improvement in distant metastases- free survival with a hazard ratio of 0.86 (p = 0.029), which translated to an increase in overall survival at 10 years from 80.7% to 82.3% (hazard ratio 0.87 with p = 0.0496). The EORTC data implies that lower risk patients may also substantially benefit, as a subset analysis stratified by nodal stage suggests those with node negative disease may benefit the most: hazard ratio for N0 is 0.79, in contrast to 0.89 for pN1, 0.85 for pN2, and 1.00 for pN3. As we move forward with the results of these trials, the question now becomes: “What is the optimal target volume for radiation oncologists when treating patients who have node positive disease?” All 3 randomized post-mastectomy RT trials demonstrated a benefit when the whole axilla, supraclavicular fossa, and the internal mammary chain were included; however, there is controversy over what target volumes should be covered. Most experts believe the greatest benefit is in covering the chest wall and the supraclavicular fossa and, therefore, purposely exclude the axilla and internal mammary lymph chain due to the potential increased morbidity. For example, the American College of Radiology appropriateness criteria for post-mastectomy radiotherapy recommends radiotherapy to the chest wall, and does not make any specific recommendations regarding the regional lymph nodes.14 In the NCCN guidelines (NCCN guidelines for invasive breast cancer version 3), the nodal region targeted includes the paraclavicular nodes and the axilla, while only including the internal mammary chain if it is clinically involved or biopsy-proven. Based on the data presented, the regional lymph nodes seem to have a substantial impact on outcomes. The MA.20 study mandated irradiation of the chest wall in both treatment arms, and there was a clear benefit in breast cancer mortality with the addition of regional nodal areas in the RT field. In Z0011, the axilla was treated in both arms and there was no detriment in breast cancer mortality no matter what fields were treated,19 suggesting the internal mammary lymph nodes and medial supraclavicular lymph nodes have a major impact in improving breast cancer mortality. Radiation oncologists and surgeons must exercise caution when applying the findings of the Z0011 trial to patients with a positive sentinel lymph node biopsy and poor prognostic factors. Additionally, translating the treatment used in Z0011 to early stage patients may not be appropriate. The survival benefit in the setting of minimal added morbidity demonstrated in MA.20 and EORTC suggests that we may be undertreating certain patients. Patient SD was technically a candidate for the Z0011 trial, but because of her age and triple-negative status, it may have been better to initially treat her more aggressively as per the MA.20 protocol. It is extremely important to consider patient and tumor characteristics when applying the adjuvant radiation treatment approaches used in the Z0011 trial to a broad patient population without considering the potential survival benefit of regional node irradiation (RNI). At our institution, treatment volumes are based on the risk of additional lymph node involvement, individual patient characteristics, dose to surrounding structures and the patients’ life expectancy. Prior to the results of MA.20 and EORTC 22922/10925, we used the Memorial Sloan Kettering Cancer Center (MSKCC)20 and MD Anderson Hospital (MDAH)21 risk nomograms. If a patient had a > 15% risk of finding additional non-sentinel lymph nodes, then levels 1 and 2 were treated. If a patient had a > 15% chance of finding 4 or more lymph nodes, then level 3 and the supraclavicular field were treated.22 Currently, we prescribe comprehensive nodal irradiation for all macroscopically node positive patients and strongly consider it for younger patients with high grade ER/PR negative and HER2/neu positive tumors or those with a lesion in a medial/central location. Omission of radiation to the internal mammary lymph nodes, or consideration of proton therapy is explored when the heart V30 > 5%, V10 > 30% if IMRT is used, or when the mean heart dose is > 10 Gy. If a woman has a cardiac risk factor such as history of ischemic heart disease, diabetes, smoking, or high BMI, a lower mean heart dose (< 10 Gy) is pursued. Women with multiple cardiac risk factors require an even lower mean heart dose and are judged on a case-by-case basis for internal mammary lymph node omission or consideration for proton therapy. This approach provides excellent locoregional control with acceptable morbidity, and will help prevent recurrences seen in the case of patient SD. Mabanta SR, Mendenhall WM, Stringer SP, Cassisi NJ. Salvage treatment for neck recurrence after irradiation alone for head and neck squamous cell carcinoma with clinically positive neck nodes. Head & Neck. 1999;21:591-594. Creutzberg CL, van Putten WL, Koper PC, et al. Surgery and postoperative radiotherapy versus surgery alone for patients with stage-1 endometrial carcinoma: Multicentre randomised trial. Portec study group. Post operative radiation therapy in endometrial carcinoma. Lancet. 2000;355:1404-1411. Marks LB, Prosnitz LR. Reducing local therapy in patients responding to preoperative systemic therapy: Are we outsmarting ourselves? J Clin Oncol. 2014;32:491-493. Eric J, Hall AJR. Radiobiology for the radiologist. Philadelphia, PA: Lippincott Williams & Wilkins; 2011. Bhandare N, Monroe AT, Morris CG. Does altered fractionation influence the risk of radiation-induced optic neuropathy? Int J Radiat Oncol Biol Phys. 2005;62:1070-1077. Giuliano AE, Hunt KK, Ballman KV, et al. Axillary dissection vs no axillary dissection in women with invasive breast cancer and sentinel node metastasis: a randomized clinical trial. JAMA. 2011;305:569-575. Giuliano AE, McCall L, Beitsch P, et al. Locoregional recurrence after sentinel lymph node dissection with or without axillary dissection in patients with sentinel lymph node metastases: The American College of Surgeons Oncology Group z0011 randomized trial. Ann Surg. 2010;252:426-432; discussion 432-423. Haffty BG, Hunt KK, Harris JR, et al. Positive sentinel nodes without axillary dissection: Implications for the radiation oncologist. J Clin Oncol. 2011;29:4479-4481. Poortmans P, Kirkove C, Budach V, et al. Irradiation of the internal mammary and medial supraclavicular lymph nodes in stage i to iii breast cancer: 10 year results of the EORTC radiation oncology and breast cancer groups phase iii trial 22922/10925. EJC. 2013;47(Suppl 2). Whelan T, Olivotto I, Ackerman I, et al. Ncic-ctg ma.20. An intergroup trial of regional nodal irradiation in early breast cancer. J Clin Oncol. 2011;29. Overgaard M, Hansen PS, Overgaard J, et al. Postoperative radiotherapy in high-risk premenopausal women with breast cancer who receive adjuvant chemotherapy. Danish breast cancer cooperative group 82b trial. N Engl J Med. 1997;337:949-955. Overgaard M, Jensen MB, Overgaard J, et al. Postoperative radiotherapy in high-risk postmenopausal breast-cancer patients given adjuvant tamoxifen: Danish breast cancer cooperative group dbcg 82c randomised trial. Lancet. 1999;353:1641-1648. Ragaz J, Olivotto IA, Spinelli JJ, et al. Locoregional radiation therapy in patients with high-risk breast cancer receiving adjuvant chemotherapy: 20-year results of the british columbia randomized trial. J Natl Cancer Inst. 2005;97:116-126. Taylor ME, Haffty BG, Rabinovitch R, et al. Acr appropriateness criteria on postmastectomy radiotherapy expert panel on radiation oncology-breast. Int J Radiat Oncol Biol Phys. 2009;73:997-1002. Recht A, Gray R, Davidson NE, et al. Locoregional failure 10 years after mastectomy and adjuvant chemotherapy with or without tamoxifen without irradiation: Experience of the eastern cooperative oncology group. J Clin Oncol. 1999;17:1689-1700. Buchholz TA, Woodward WA, Duan Z, et al. Radiation use and long-term survival in breast cancer patients with t1, t2 primary tumors and one to three positive axillary lymph nodes. Int J Radiat Oncol Biol Phys. 2008;71:1022-1027. EBCTCG: McGale, P, Taylor, C, Correa, C, et al. Effect of radiotherapy after mastectomy and axillary surgery on 10-year recurrence and 20-year breast cancer mortality: meta-analysis of individual patient data for 8135 women in 22 randomised trials. Lancet. 2014;383:2127-2135. Miles RC, Gullerud RE, Lohse CM, et al. Local recurrence after breast-conserving surgery: multivariable analysis of risk factors and the impact of young age. Ann Surg Oncol. 2012;19: 1153-1159. Jagsi R, Chadha M, Moni J, et al. Radiation field design in the acosog z0011 (alliance) trial. J Clin Oncol. 2014;10:32(32):3600-3606. Van Zee, KJ, Manasseh, DM, Bevilacqua, JL, et al. A nomogram for predicting the likelihood of additional nodal metastases in breast cancer patients with a positive sentinel node biopsy. Ann Surg Oncol. 2003;10:1140-1151. Mittendorf, EA, Hunt, KK, Boughey, JC, et al. Incorporation of sentinel lymph node metastasis size into a nomogram predicting nonsentinel lymph node involvement in breast cancer patients with a positive sentinel lymph node. Ann Surg. 2012;255:109-115. Katz, A, Smith, BL, Golshan, M, et al. Nomogram for the prediction of having four or more involved nodes for sentinel lymph node-positive breast cancer. J Clin Oncol. 2008;26: 2093-2098. Radiation therapy following a positive sentinel lymph node biopsy: A radiation oncologist’s dilemma. Appl Rad Oncol. Prepared by Mr. Rana, an MSIV, Department of Radiation Oncology, University of Maryland School of Medicine, Baltimore, MD; Dr. Patel, a PGY5 in radiation oncology, Department of Radiation Oncology, University of Maryland School of Medicine; Dr. Tkaczuk, associate professor, Department of Medical Oncology; Dr. Kesmodel, assistant professor, Department of Surgical Oncology, and Dr. Feigenberg, associate professor, Department of Radiation Oncology, Marlene and Stewart Greenebaum Cancer Center, University of Maryland School of Medicine.